This is my third time participating in the O Canada blogathon. 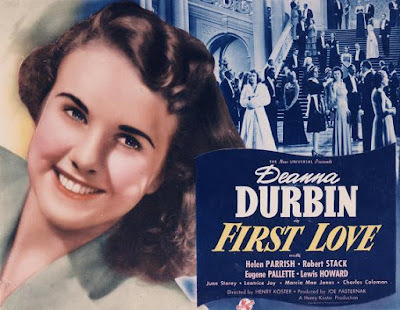 It’s also my third time writing about Deanna Durbin. If you visit my blog, you’ll realize that my love for Durbin runs deep. She was an international star who had the largest fan club in the world during her heyday. First Love was a milestone in Durbin’s career. It showed Durbin as a maturing young woman showcasing her first taste of romance. Loosely based on the Cinderella tale, First Love is a coming-of-age sweet romance. Durbin plays Connie Harding an orphan who we meet on her graduation day from Miss Wiggins’s boarding school for girls. After graduation she goes “home” to New York to live with relatives, the Clinton family, who don’t seem to care for her. They don’t even come to her graduation, but instead send a butler to pick her up. Sad and unhappy, Connie has nothing in common with the Clinton’s beautiful, socialite daughter, Barbara. In fact, Barbara despises Connie—and pretty much any female who she feels is competition—and seems to take pleasure in humiliating her at every opportunity. The rest of the Clinton family includes Uncle Jim (Eugene Paulette), Aunt Grace (Leatrice Joy), and Cousin Walter (Lewis Howard). The Clintons, in all their quirkiness somewhat resemble the Bullock family from My Man Godfrey (1936). Ironically, Eugene Paulette was the hapless father in that classic too. 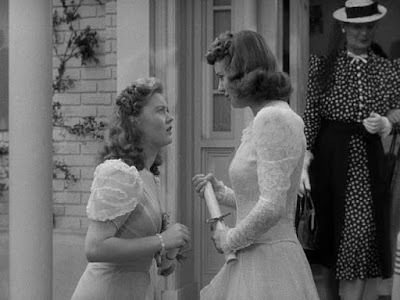 Barbara bullies Connie into helping her get the attention of Ted Drake (Robert Stack), a handsome young heir who all the debutantes in New York City are after. Connie makes a fool of herself, keeping Ted occupied at his country club while Barbara hurries to join his riding party after oversleeping. Connie is smitten by Ted almost immediately, but feels he’s out of her league. The Drake family is hosting a ball that the Clintons and other New York City socialites will be attending. When Connie gets invited to the ball, she can hardly believe it. The servants pull together and buy her a dress and new shoes. Her dreams of having a proper evening with Ted are dashed when Barbara concocts a lie about some relative coming to visit the evening of the ball. She suggests Connie stay home to greet him, which her Aunt Joy seconds. Connie is crushed. But the servants have a plan for her to get to the ball. The servants concoct a plan the keep Barbara, Walter, and Mrs. Clinton from getting to the ball until after midnight. Connie is escorted to the ball by six police officers riding white motorcycles (a servant’s brother is a cop). She even gets to ride in the Commissioner’s car! The butler (Charles Coleman) informs her that she needs to be home before midnight (just like Cinderella). At the ball, Connie, in a comical scene, is accidentally introduced as the singing entertainment. Her performance is a huge hit with the crowd. Her beautiful singing gets the attention of Ted, who asks her to dance. The two dance and talk the night away losing all track of time. Connie reveals that she was the girl that delayed him at the country club, which seems to intrigue Ted all the more. Ted tells Connie that he’ll be leaving for South America in a few weeks to carve out a life of his own. It’s at this point that the two kiss. While the two are caught up in the moment, Connie realizes that it’s after midnight. Remembering the butler’s warning, Connie runs away from Ted, losing her shoe in the process (more shades of Cinderella). While she is leaving, the Clintons show up. Barbara sees Ted holding a shoe and also spies a young woman she thinks looks like Connie leaving the ball. After a few more queries, Barbara is convinced that Connie is the girl everyone at the ball is talking about. So convinced is she that she rushes home to make sure. At first Barbara thinks she may be mistaken when she bursts into Connie’s room to find her asleep in bed. But when she spies a discarded shoe on the bedroom floor that is the match to the one she saw Ted holding, she rips the bed covers off revealing Connie dressed in her ball gown. Barbara tells Connie that Ted knew who she was all along and was just playing her for a fool. Connie is so hurt and humiliated that she packs her bags and takes the first train back to Miss Wiggins’s boarding school. She’s decided that she wants to become a teacher at the school. Miss Wiggins (Kathleen Howard) tries to talk Connie out of it by telling her, in the most unflattering terms, what the life of a spinster teacher is like. Connie doesn’t like what she hears, but she agrees to stay on. Miss Wiggins has Connie sing “Un bel di” from Madame Butterfly to make the spinsters cry. She tells her, “spinsters are only happy when they cry.” While Connie is singing the aria, Ted walks in with the missing shoe. When Connie sees Ted standing at the back of the recital hall, she falters a bit and then stops singing to run into Ted’s arms. A happy ending or as the screen tells us, “They lived happily ever after,” just like Cinderella! Backstory: First Love is a delightful movie. 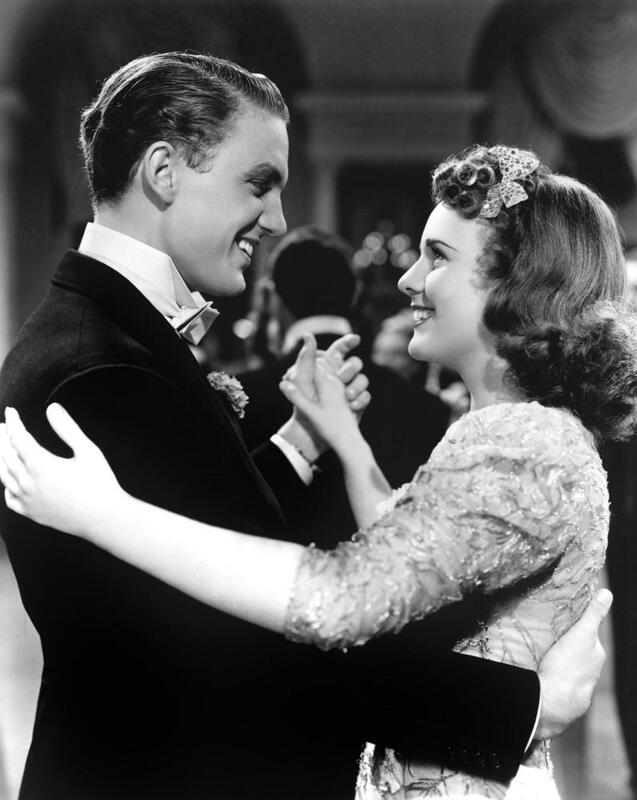 It is successful in part because of Deanna Durbin’s winning on-screen personality and the wonderful supporting cast. The film was an important milestone in Durbin’s career. With five hit films under her belt as a juvenile star, Durbin was growing up right before the eyes of the American public. The year before, Durbin won a special Juvenile Academy Award. Would the public accept this older, more mature Durbin? This film was also a milestone for Robert Stack. It was his first film and he got to give Durbin her first screen kiss. The publicity around this event was extraordinary. “The kiss heard around the world” was the word from the press. Durbin was so popular all over the world during the late 1930s. Anne Frank had a picture of Durbin and Stack from First Love on her bedroom wall in the family’s hiding place in Amsterdam; it’s part of the museum to this day. Durbin’s fan club was the largest of any star during her heyday. Universal seriously considered filming First Love in Technicolor. Although it’s black and white cinematography by Joseph A. Valentine is superb—he was nominated for an Academy Award—this movie would have been wonderful in color. This was Durbin’s fourth film directed by Henry Koster—she had made only six films thus far—and produced by Joe Pasternak, the two men most responsible for Durbin’s screen success. In Stack’s autobiography, Shooting Straight (1980), he relates that he auditioned for First Love with Helen Parrish, who Stack thought was “a beautiful girl.” Speaking of Parrish, this was her third Durbin film. She was her nemesis in Mad About Music (1938) and her older sister in Three Smart Girls Grow Up (1939). Durbin and Parrish may have been antagonists on the screen, but the two were reportedly best friends in real life. Other actors that frequently appeared in Durbin films include Marcia Mae Jones (Mad About Music, Nice Girl? ), Charles Coleman (Three Smart Girls, Three Smart Girls Grow Up, It Started with Eve), Mary Treen (Three Smart Girls Grow Up), Kathleen Howard (Three Smart Girls Grow Up), Thurston Hall (Three Smart Girls Grow Up, Lady on a Train, Up in Central Park), Eugene Paulette (One Hundred Men and a Girl, It’s a Date), Samuel S. Hinds (It’s a Date, Spring Parade, Hers to Hold, Lady on a Train), Lucille Ward (It Started with Eve), Frank Jenks (One Hundred Men and a Girl). Not so trivial trivia: Mary Treen and Samuel S. Hinds found screen immortality by appearing in the Frank Capra classic, It’s a Wonderful Life (1946). This post is part of the O Canada Blogathon, hosted by Kristina of Speakeasy and Ruth of Silver Screenings . Click here to check out the other great posts in this annual blogathon.